While we look forward to working with you to find the perfect puppy or dog, please consider adoption as your first option, check with your local shelter, German Shepherd rescue, or www.petfinder.com first. If you wish to continue with us, please complete and submit our client questionnaire, so that we can better understand your needs and requirements, or contact us by phone or email to discuss at your convenience. We are committed to ethical breeding practices as outlined by the AKC Bred with H.E.A.R.T. 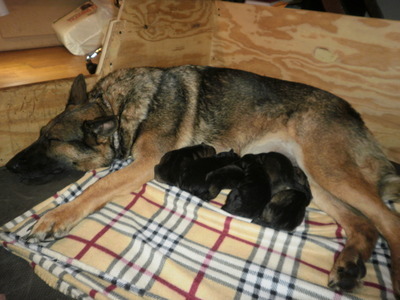 program and the German Shepherd Dog Club of America. We are interested in partnerships, affiliate and vendor programs and alliances. Cross Keys K9, Inc. provides support, resources, and research to all of our clients, for the lifetime of their dog(s). If we do not have a dog that meets your needs, we will refer you to a breeder that shares our philosophy that may have a puppy or dog that is better suited for your requirements. Questions and research requests will also be honored, and we are happy to share the data and observations we collect on our dogs over time and throughout their lifecycles. Dogs presenting higher and/or more ambitious drives are evaluated, worked and placed appropriately for applications such as single/dual purpose police and military; tracking and competition, depending on client requirements, objectives and training provisions. We welcome agencies and entities utilizing working dogs including, but not limited to, police, fire, military, search and rescue, therapy and companion dogs to contact us if you need assistance, referrals or placements. © 2012 - 2018 Cross Keys K9, Inc. All rights reserved.